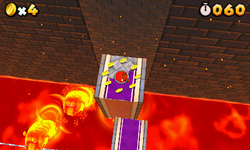 Special 8- Bowser's Castle is the sixth level of Special 8 in Super Mario 3D Land and the penultimate level overall. It is based off of World 8-Bowser: Part 1. The player starts off on a platform with three Hammer Bros. and a P-Switch. After the P-Switch is activated a platform will rise from the lava and lead to some more platforms. At the end of the segment is a Warp Box. The Warp Box leads to a platform with a Hammer Bro on it and a Switchboard next to it. The Switchboard leads to a platform with a P-Switch in the middle of it, once it is pressed the platform will move up to a platform of Hammer Bros. and some platforms that appear when the player goes close to them. These platforms lead to a Warp Box that leads to the Dry Bowser fight. After the battle is a Warp Box that leads to the Goal Pole. After Mario beats Special 8-Castle, another cutscene appears. Another letter has floated down on World 1-1, and the three Toads who accompanied Mario in his adventure investigate while sporting their Tanooki forms. To their surprise, Bowser has kidnapped Princess Peach once more. Then, Mario or Luigi must defeat Bowser in World 8-Bowser's Castle again. After that, a picture of Peach wearing a Tanooki Suit is unlocked. Once 5 stars are present on the profile, Special 8-Crown, the very last level, is unlocked. Star Medal 2: In the area with three Hammer Bros. it is floating on the top left platform. Star Medal 3: On a fence during the boss battle. This page was last edited on April 5, 2019, at 18:25.